The situation at the front line deteriorated. 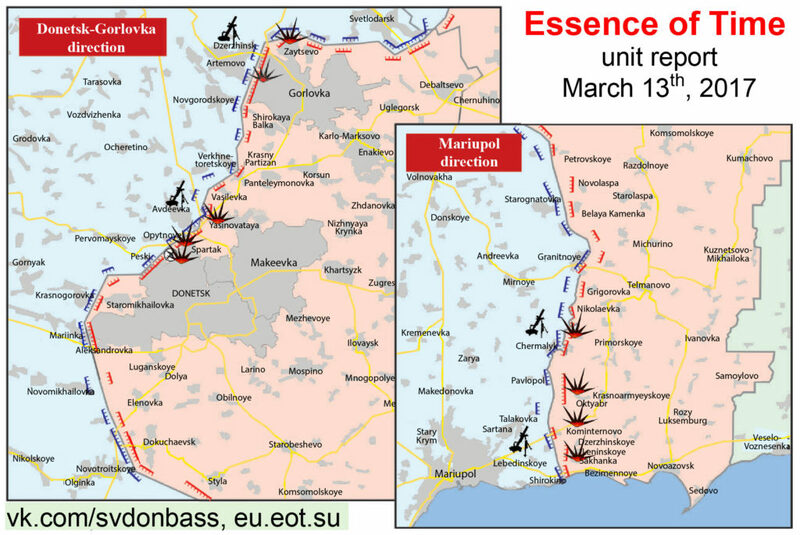 The Ukrainian army shelled the residential areas of Donetsk with heavy artillery and tanks, a source in the Donetsk People’s Republic People’s Militia (DPR PM) informed a Rossa Primavera News Agency reporter on March 13th. Along the Gorlovka direction, the Ukrainian army’s artillery opened fire on the village of Zaytsevo and mining village of Gagarina (Glubokaya). On the Donetsk direction, the intensity of the shelling is sharply increased. The Ukrainian army shelled Yasinovataya, the village of Spartak, and the Kuybyshevsky district of Donetsk. At least 13 houses were damaged or destroyed. 4 civilians were injured. In the north of Donetsk, school was damaged in the Oktyabrysky miscrodistrict. The Ukrainian military opened fire with heavy artillery and tank guns. The situation at the south direction remains tense. In the village of Tavricheskoye in the Telmanovsky district of DPR, 2 houses were damaged as a result of the Ukrainian army’s shelling. Trench combat continues in the area of Oktyabr, Sakhanka, and Kominternovo in the Novoazovsky district. According to DPR PM intelligence, the Ukrainian military redeployed a battery of “Gvozdika” self-propelled artillery vehicles of the 92nd independent mechanized brigade. Battery of BM-21 “Grad” multiple launch rocket systems (MLRS) was uncovered in the area of Primorskoye, in the zone of responsibility of the 36th independent Marines brigade. Tank company of the 54th independent mechanized brigade was noted in the village of Nikolaevka. According to the recent information, during March 12th, the Ukrainian side opened fire on the DPR territory around 2,000 times. Heavy artillery was used 83 times, tanks – 33 times, mortars of various calibers – 627 times, infantry fighting vehicles and armored personnel carriers – 106 times. Anti-aircraft guns, grenade launchers, and small arms were utilized 1008 times. This entry was posted in News from Ukraine and tagged DPR, Shelling, Situation report, Ukraine, Violation of Ceasefire. Bookmark the permalink.